The workplace is not somewhere that should be dreaded by your team. You want them to look forward to going to work everyday and enjoy their day-to-day activities. You should ensure your company culture reflects your brand beliefs. It’s important to nurture a positive culture from the the beginning as it may be difficult to change the dynamic of the workplace after it is already set. A happy environment means a happy team which leads to more productivity. Here are 5 simple things at Nimvelo we do to keep a positive workforce. 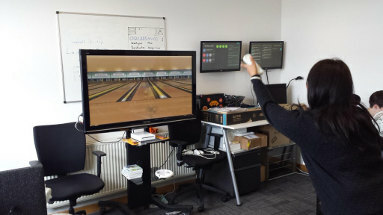 Flexibility is a key aspect at Nimvelo. David, one of our team members currently works remotely – however we never feel likes he’s too far away, with our business phone system we’re able to call him easily. Whether it is working from home or picking your start and finish time, every day we can pick an option which suits our employees best. 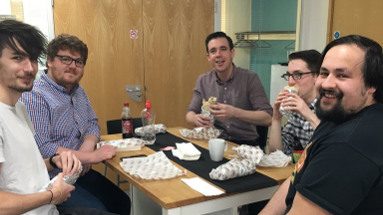 Every month we step away from our desks and have lunch as a team. We usually order pizza in and make some delicious coffee. Just simply taking the time to chat about things outside of work bring us closer together as a team and gives us some time to share new ideas for the business or just share things we’ve been working on outside of work. That’s right. Kittens, exploding. There’s a relaxing atmosphere around the office; that is until we decide to break for a game of exploding kittens. We’re able to cut for a break when we want to have a game, 2 members of the team even developed a trello board to go over some more advanced rules – the games get competitive, so you always need to be at your best. At the beginning of each week we all message in Slack with our intent for the week. By doing this we let the team know what we are getting up to, and if they have anything to contribute they can. This also gives the team freedom to work on what they think is best. Open discussions are a regular thing here, everyone has a say, and everyone’s opinions are valued. Being at work at Nimvelo never actually feels like being at work. You’re able to dress in what makes you feel most comfortable; whether it’s shorts, or a suit, anything goes. Not all the time spent at work is devoted to work, you have the freedom to research new technology and ideas and discuss it with the team. Then you can go ahead and start developing your new ideas as we’re all about inventing new ways of working here at Nimvelo. There are so many other things we do here to build on our company culture. Building your team around your company culture is a great way to make sure your new recruits fit your brand and what you stand for. What do you do to nurture a happy working culture? Have you ever played exploding kittens? We’d love to hear what makes your employees happy and productive – tweet us and let us know. If you liked this blog or want to read more blogs like this then join the Nimvelo community by signing up to our monthly newsletter below!